Some photographers have the power to far outstrip the borders they initially admit. Andréas Lang is one of them. Who last winter saw in Berlin his Kamerun und Kongo – eine Spurensuche und Phantom Geographie at Museum of German history (an insight into German colonialism in Congo, Cameroon and CAR) probably will be no surprised by the photo he proposes for Landing Pages. 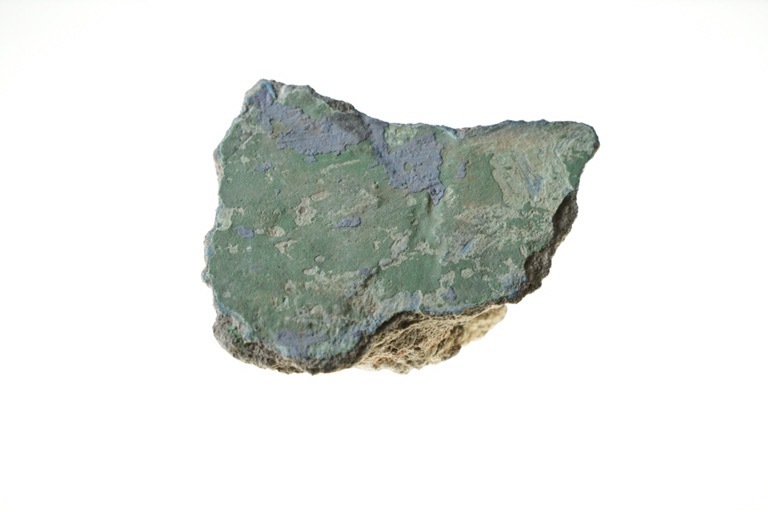 A piece of the yet destroyed Illjo Bar, a Brazilian- styled historic building located near Tinubu Square in Lagos Island, Nigeria ; the remained pieces of it still keep “the blue and green painting from the former interior decoration” Lang explains, “the stones almost look like fragments with forest, lakes and rivers …and one of them (this one) had the likely shape with the borders of Nigeria”. The fact is that this piece of the Nigerian past represents at best the poetics of fragments Lang is used to put in his African portraits. The green fragment unveils the hottest issue of our age – the Anthropocene and its grim side effect, the ecological crisis – that is legacy/inheritance pattern. The question the fragment arises is : what must we conserve of the past and why should we do it ? It’s a worldwide question, a global question. It seems that especially Europe struggles to provide an answer ; it is due to the simple evidence that European countries are rooted in inheritance as a matrix of meaning. But the conflict between past and present – Andréas Lang reveals – is more acute in post colonial Africa where capitalism is rampant (despite of the emerging market for renewable energies ) and progress is at risk to be only an imported idea. Somewhere where power beats, someone decided to destroy such an important building (Ilojo Bar recalls a terrible page of the history book, but, just the same, protected part of the identity of the Yoruba people) and from outside it is pointless. But considering the surrounding glass buildings all around, well, the observer can recognize a sort of fracture. This is the rift in the expected continuity between past and present, awareness and modernity, identity and consume. Fragments are not only fragments : they testify for the collapse of the past merging into the anonymous use of resources, human beings and time we call progress. The key to understand this Stimmung is the small, green piece of wall. What is really this fragment ? A specimen ? A fossil ? A testimony ? These days ( Anthropocene ) the difference between fossils and living objects is totally collapsed. Many reasons are possible, but the main one is the extinct sense of time and space. The Brit philosopher Timothy Morton ( famous for his book Dark Ecology ) talks about hyperobjects to describe the ecological realities we are engaged in (climate change, for instance, and extinction as well). But it is not enough. Fragments are the very periphery of our time: and fragments, well, are fossils, relics, specimens, all the stuff survive the brutal cleanining led by economic power. But Andréas Lang reached something deeper by saying these fragments look like maps with green forests and blue lake. Fossils (and devastated fragments of the past, too) are a strong metaphor for wilderness, reduced to patches of the ancient greatness. The increasing dismiss of the past affects the increasing abandonment of Nature. We forget the past because we forget Nature. Yet, the green fragment contains also a deep sense of history, a sort of Sensucht. Michel Foucault assumed that to be historic are not only the objects but also the mindset (Weltanschauung) they drive. Contemporary fragments tell us our own history and the relevancy we are willing to give to landscape and time.